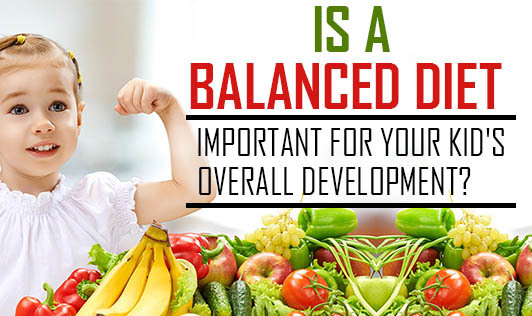 Is a balanced diet important for your kid's overall development? Early childhood is an important phase of development for your child. A diet that provides for his rapid growth and development, and fulfils the daily requirement of calories, vitamins, minerals, fat and fiber is called a well balanced diet. During the first few years of life, children grow rapidly. From birth to your child's first birthday, he triples his birth weight. During the next few years, growth is not too rapid but it is still a phase of continuous growth and development. During this period, your child is in need of more calories, protein, iron, calcium, vitamin A, vitamin D, vitamin C and other nutrients to support his growth. Poor nutrition can hinder growth and make your child weak and frail. Calcium is necessary for bone and teeth growth. Children who eat 2 to 3 servings of dairy products every day, such as low-fat milk, low-fat yogurt or natural cheese, can support the growth of strong bones and decrease their risk of developing osteoporosis later in life. One of the nutrients essential for muscle mass development is iron. That's why children need plenty of healthful iron-rich foods, including lean meats, fish, beans, green vegetables, nuts and iron-fortified grains to support their muscle development. Lack of iron may lead to anemia making your child more prone to infections. Good nutrition is essential to healthy brain development in children which is, of course, critical to learning. Fat is an important part of your child's diet, especially in the first two years of life. Fat found in whole-milk products helps improve brain development. Iron is also important for cognitive development because it carries red blood cells to the brain. Children who eat healthy food are likely to perform better academically, feel better about themselves, their bodies and their abilities, cope with stress and regulate their emotions better, avoid feelings of low self-esteem, anxiety, and depression. Establishing healthy eating habits early in life can lead to long term healthy behavior in adulthood. Refined and processed foods contain high amounts of sugars, fats and chemical preservatives that are unhealthy and have a long term effect on your child's health. These may cause obesity and type 2 diabetes on a long run. Eating a balanced diet is not about having one good meal. It is about creating healthy options for your child and maintaining it over a period of time into his adulthood.